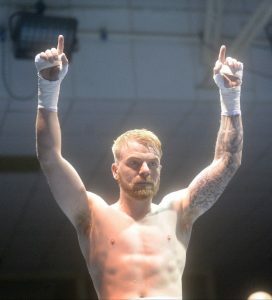 ON 6 October, one day short of a year since his last professional fight, Allan Phelan will once again attempt to get some momentum going with his career when he steps through the ropes for his 14th pro fight at the National Bastketball Arena. It’s been a frustrating year for Phelan who had hoped to build on four Dublin fights during 2017 but for a variety of reasons has been inactive since last October. He is now hoping for a change in luck. He joined up with Assassin Boxing at the end of July and that move paid immediate dividends when he was added to their October show. Phelan explained the reasoning behind linking up with Ray Moylette and 12 other Irish boxers in the Assassin stable. “Things were pretty slow and trying to do it myself wasn’t really working, it was getting harder and harder to get fights in Ireland. Assassin have Ray Moylette and they are working with my coach Paschal (Collins) so it just made sense to jump in with them. They’ll get me fights over in America as well as here in Ireland. It makes sense and I’m looking forward to working with them. “I’m going to fight an eight rounder in October and then hopefully fight for an Irish title before the end of the year and then start stepping up. I just want to start moving forward, being inactive on and off for the last seven years hasn’t been good. I want to get busy and stay busy and start stepping up the ladder,” said Phelan. For a boxer who only wants to fight, the year of the ring has been tough but has only made him more determined to reach his goals. “It’s been frustrating, I was supposed to have a fight or two but injury and stuff set me back and some shows fell through as well which puts a negative aspect on it. I just stayed tipping away at training and then when the chance came to sign with Assassin I said I’ll take it because they said they’d do a lot for me and have regular fights for me. “It makes me even more hungry because now I have the chance to start stepping up the ladder and I just want to use all the negatives from the last few years in a positive way,” said Phelan. Phelan’s four previous fights in Dublin were all in the National Stadium and he is looking forward to boxing at a new venue, the National Basketball Arena. It’s seven years since the venue last hosted a boxing night but the likes of Michael Carruth, Wayne McCullough and Naseem Hamed have fought there previously. “From what I’ve seen of it, it should be a great venue. I’m looking forward to seeing it all set up, sounds like it will be a great night, there are some great fights on the night. There will definitely be a serious atmosphere there,” said Phelan. There has been a lot said about the negative side of boxing in Dublin and cancelled shows haven’t helped the sport in the eyes of boxers or supporters but Phelan is hoping that a successful night can get people talking about the good in Irish boxing again. “This is a good time to be putting on a show in a good venue like the Basketball Arena. Hopefully that will put Irish boxing on the radar, where it should be. We want to get Irish boxing back up to where it was before all the shows started getting cancelled and the bad publicity,” he said. After all, it was only recently that TJ Doheny became the third Irish boxer, after Katie Taylor and Ryan Burnett, to win a World title with a brilliant win in Japan. “That was fantastic, huge for Irish boxing. It’s fantastic for TJ and to see the way he has done it, to go over to Tokyo and beat him in his backyard is really, really good. Ireland has several World Champions now and it shows what we have to offer, there are some serious, serious boxers here in the professional game. “He didn’t really go anywhere in the amateurs, he was just boxing in Portlaoise and then went over to Australia and built himself up there. It definitely can be done, some people think you can only do that if you have the amateur background but it is possible. If you get the backing and following behind you anything is possible in the boxing game,” said Phelan. He will now step up his preparations for the fight, and that could include a sparring trip to Las Vegas where ‘Spike’ O’Sullivan will be getting ready for a fight there in mid-September. Tickets on the night cost €40 & €60 and VIP tickets are €100. You can contact Allan Phelan at 083 8199549.